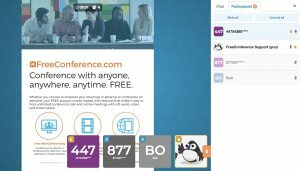 Is free screen sharing in the FreeConference free plans? Yes, both the host and participant can share their screens. Free accounts include online meetings with up to 5 people at a time. This includes the use of Video Conferencing and free Screen Sharing. Everyone can view what’s displayed in the online meeting room and the presenter can alternate between any of the 5 attendees with the click of a button. 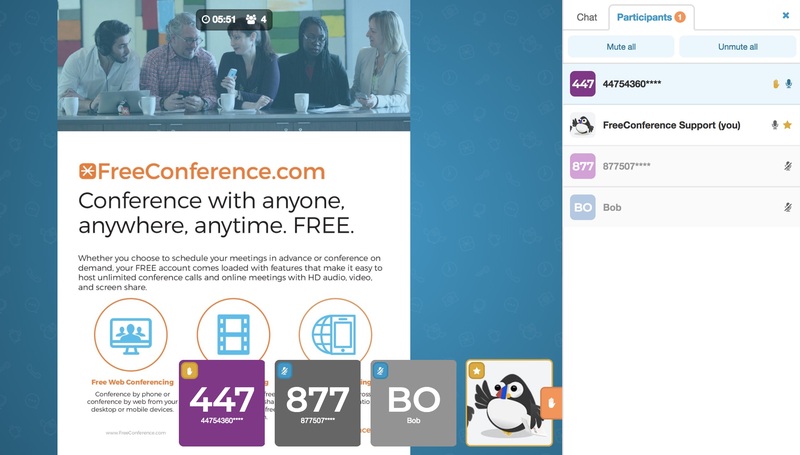 This is a benefit of FreeConference.com! Other services limit screen sharing to the account holder or require an upgrade to allow for additional presenters. Great for meeting with remote workers or employees who are regularly traveling, our free screen sharing service allows you to present documents, share files and work on them together with your team, wherever they are. Just message everyone your meeting link or access code. As long as each participant has internet access, they can hop on to a conference from practically anywhere. Screen sharing works within Google Chrome or using one of our standalone Apps on a computer. If you are holding training sessions or larger company-wide meetings and would like to allow more people to view your screen sharing session, take a look at our paid plans which allow up to 100 online participants. You would also be able to record your sessions to share with anyone who was unable to join the live meeting. For more detailed information and instructions on how to use the free screen sharing service, please visit our support site. We also have a great video available which walks you through how to use your online meeting room in general.